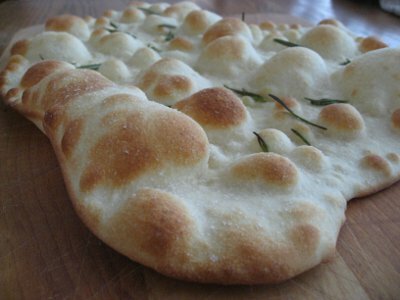 This thin rosemary focaccia is excellent eaten hot, just out of the oven. Can be enjoyed by itself, with salad, or with a platter of cheeses and salumi. In a bowl, mix the bread flour with the all purpose flour. Use an electric mixer to knead the dough. Pour half of the flour in the mixer’s bowl. Add mostof the water keeping 1/3 of a glass aside. Warm slightly the water kept in the glass and use it to melt the yeast. Add the melted yeast into the mixer’s bowl. Mix well until all ingredients are smoothly mixed. Add the salt to the remaining flour and slowly add it into the mixer’s bowl as it is kneading the dough. When all of the flour is incorporated into the dough, let the mixer knead the dough for 10 more minutes. Transfer the dough in a glass or plastic bowl, cover with clear plastic wrap, and let it rise in a warm place for 60 minutes. I put it inside the oven turned off with the oven light turned on. The dough should be more than doubled in volume. Take it out of the oven. Position a pizza stone in the lower part of the oven, on the second rack from the bottom. Heat the oven to 500F (260 Celsius), use both the upper and lower heat if possible. Roll less than a quarter of the dough into a very thin (1/8″) rectangle about 16″x11″. 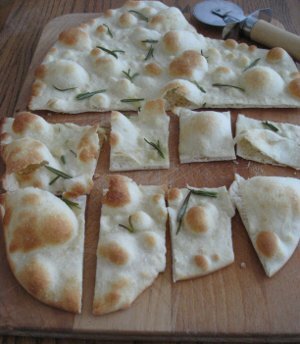 Spread extra virgin olive oil on the thin focaccia ( be generous), sprinkle with sea salt and rosemary leaves. When the oven is hot put the focaccia on the pizza stone and bake for 3 minutes. I have dopio 00 flour. Would it be possible for me to use that instead of the bread flour? Hi Susan, I am afraid that the 00 flour may not have enough strength (gluten) to ensure that it will rise well. You may end up with small or no “bubbles”, and a stiff focaccia. Bread flour ensures that it has more strength (more gluten in the dough) and therefore rises well. The gluten in the dough creates like an elastic “mesh” which traps the carbon dioxide developed during the raising resulting in larger bubbles. Unfortunately it is not possible to tell what is the strength of a flour because it is not indicated on the package commonly found in retail shops. As a rule of thumb, the all-purpose flour is weaker and the bread flour is stronger.